When one thinks of Star Trek they may grin with nostalgia at its 500+ hours of campy science fiction entertainment, or maybe just roll their eyes at the franchise’s cult-like “Trekkie” fans. The first thing that comes to mind is usually not the video games which have permeated practically every genre known to man and it’s probably even invented a few of its own. 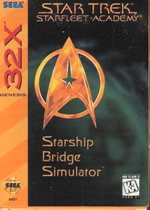 In any case, Star Trek games are historically bad, though there have been several excellent titles in recent years such as the Elite Force series or Bridge Commander that were intent on breaking the Star Trek curse, though neither of these titles really made a splash outside of Trek’s fan base. Turn back the clock a few years to Starfleet Academy: Starship Bridge Simulator which was originally released for the Super Nintendo. The game set out to put you in the position of a captain-in-training, simulating what it would be like to command on the bridge of one of Starfleet’s huge capital ships like the Enterprise. In actuality, the game is a thinly veiled, and quite mediocre flight simulator. The game featured very crude 3D polygon graphics which were mildly impressive for their day. The 32X would later receive a port of this title, giving the polygons greater detail and a splash of color, the 2D graphics are also sharpened considerably and look much better than the older version. Unfortunately, nothing else was done to improve the game, making it nothing more than an exact port of the Super Nintendo title with a minor facelift. If you have the SNES version of this game, don’t bother with the 32X upgrade. Although they were nothing special by the time 32X rolled around, the graphics are still nice. You can distinguish the ships from a good distance and they all resemble the vessels seen on TV or in the movies. All the ships center around those in the original Trek series and films so don’t expect to find vessels from The Next Generation and beyond. The 2D graphics are impressive, and Star Trek geeks will definitely get a kick out of the trouble the game designers went through to give the different vessels unique bridges instead of using a one size fits all model, which was one of the faults of the otherwise vastly superior PC version of the game that was released years later. The gameplay of Starfleet Academy is where everything takes a sharp nosedive and rams into the nearest sun. Because of your view-point on the bridge the actual playing area of the game is small, making it difficult to get enemy ships lined up on your screen. The radar is annoyingly hard to use and you’ll spend most of your time spinning around in circles to get a few shots off at your opponent. Battles ultimately become a test of who can fling the most phasers and photon torpedoes before they explode once both you and the enemy ship turn and face each other to attack. The combat is so incredibly dull that even the most adamant Trekkies will have a hard time having any fun with it. This wouldn’t be bad if the game offered more exploration, adventure, and problem solving, but the combat is the focus of the game and there’s really nothing redeeming about it except the half decent graphics. On the bright side, the game has an enjoyable story. You can wander around the academy and speak to your fellow students, unfolding the story in the style of an oversimplified point and click adventure game in-between missions. You can even challenge fellow cadets to a game of pool which has pretty good graphics and is actually kind of fun. Maybe they should’ve created the game Starfleet Poolshark instead? Another nice touch is the ability to play a few famous missions from Star Trek history such as the original series episode Balance of Terror or the legendary battles from Star Trek II: The Wrath of Khan and Star Trek VI: The Undiscovered Country. Of course, they’re not as fun as watching the movies themselves but their inclusion will still bring a smirk of nostalgia to any dedicated fan who may have always wanted to beat the snot out of Khan more efficiently than that overrated Captain Kirk. The musical score is recognizable Star Trek tunes from the movies, there’s nothing wrong with the music but it’s practically indistinguishable from the SNES version. The sound effects are also standard Trek which is fine. Still, the music is one of the areas that they could’ve done more with when they made the 32X port. Overall this is a pretty poor game. The ambition was there, but they just didn’t seem to know how to put it all together and make a game out of it. It’s still good as a waste of time if you’re a serious Trekkie, though if you are you’ve probably played the PC version which is actually a good game that I’ll recommend well before telling you to spend your money on this. Starfleet Academy: Starship Bridge Simulator was an overall disappointment and could’ve been much more than just a simple port had they put any effort into it. Even with its moments of nostalgia it’s still one of the reasons why a black cloud hangs over the Star Trek video game franchise. Love this game. 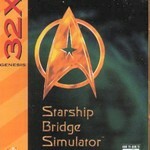 It’s probably the closest to a genuine Star Trek experience you can get on a console. I find that the graphics in the 32x version are waaaay better than the snes version (derp), but the radar is buggered up compared to the snes version, so you have pluses and minuses to each one. Personally I like the 32X version better. Still play it to this day, it’s a great escape into the world of Star Trek. As both a gamer and a minor Trekkie, I find this game quite fun. I love the diversity of options and missions, the graphics are superior to the SNES original, the atmosphere brilliantly captures the Star Trek spirit, and from the intro to this review, I am suspicious that it might be a bit prejudiced. You seem to have come into writing this from a negative standpoint, expecting the game to be bad, and therefore, only noticed things you felt detracted from it. This game deserves far better than a ‘3’. Even if you dislike it, you should be able to detach yourself enough to think of if others will enjoy it. This game is not perfect, but I’d give it about a ‘7’ myself.